For another contest, I was looking for a creature type nobody else did and I came across a creature type with only 8 cards. Now, I didn't get an entry in on time, but I have been thinking of doing this contest ever since. So, here we have, Rare Creatures. 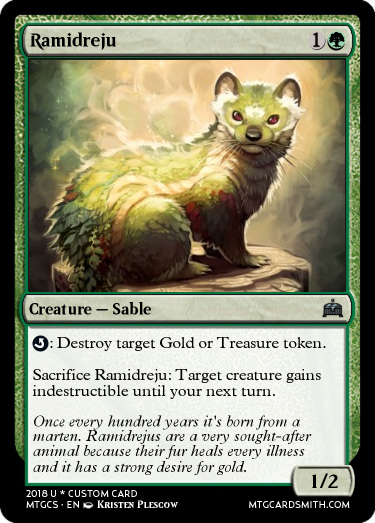 Make a creature card of a rare creature. Ends May 19th. 1. For it to be a rare creature, there has to be less than 20 cards of them. 1st Place: A follow or 4 favorites of choice. Specters only have 19 creatures, and are pretty under represented, given the cool abilities they all have (depends on your point of view). 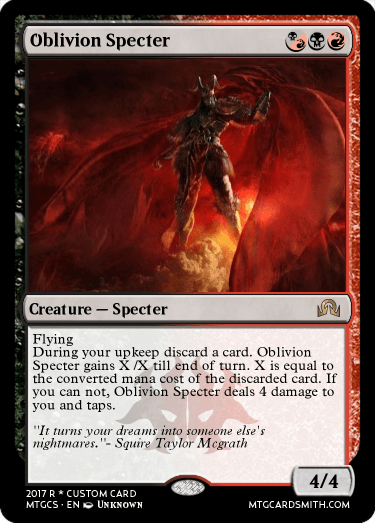 Decided to mix it up and make the first non-black Specter. Cool! I didnt even know that was a creature type. Turtles have only 11 creature cards, and are also my favorite animal! So here goes! 2 of the turtles have shroud, but that would mess up some enrage shenanigans, so I went with hexproof instead. 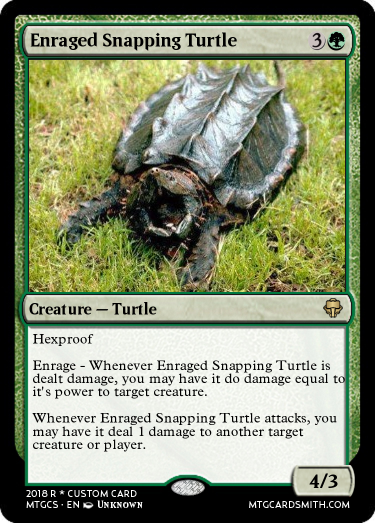 Lots of turtles also have things to do with them attacking, and this one's a snapping turtle, so it makes sense that it would deal damage. P.S. Turtles aren't even on your list, and if they are, the list doesn't have them under the correct number! P.P.S. Turtles are there, just under 10 instead of 11. Yeah, the list is not up to date and I want a better one. That is just one I found. I know all other wraith cards had swampwalk, but i felt it didn't fit the idea i had for the card. Sponges get no recognition - only 1 exists. 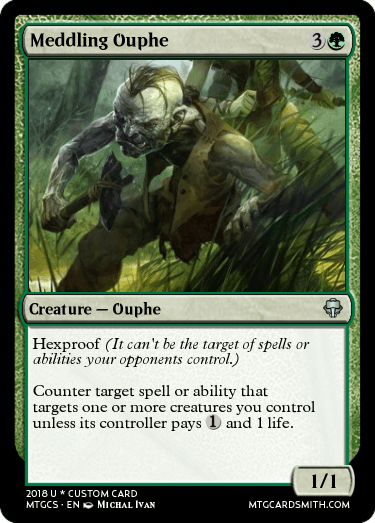 This captures the idea of slowly converting your opponent's efforts into your own resources, and ultimately using them against them in a 0/5 blocker. The idea is it eats Nothing..or in this case exiled cards. Nirvana is the state of wanting nothing, so felt like the right name for it. What an excellent and fun list! No, it's not up to date but it's not terrible, either. Thanks for sharing it! 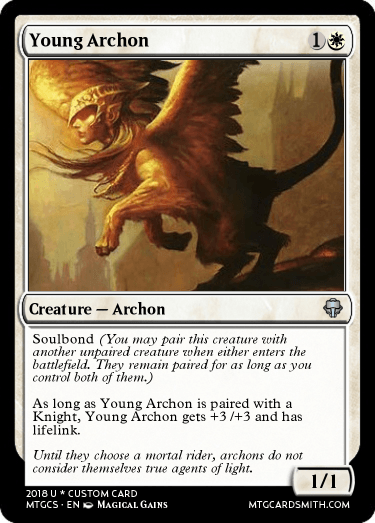 What is a mighty archon before it choses its rider? 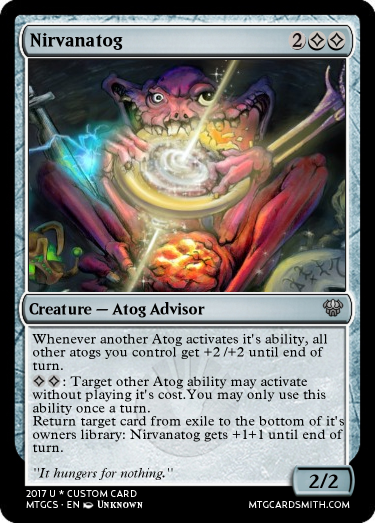 There has only been 4 Surrakar in MTG. It was hard to find appropriate artwork, but I think this fits quite well. @Lastjustice Nirvanatog Smells like Teen Spirit. @KrampisZman I tried put it into a heart shaped box..then I thought to myself, Nevermind! @lggisbert - Of 104 golems in Magic, there is only one Golem that is all colors, but none that are green or green and another color. Good job! @Scott_Anderson Why do I smell irony in that sentece? @lggisbert I apologize for speaking imprecisely. I mean to encourage and concur - you have made the first true green golem. I don’t mean sarcasm or facetiousness. Scott_Anderson ok with this formality, how can i reject, so is the card cool? @TigerFang8 about the text, how would you put ? @LGGisbert what about the text?